What a way to say it from the heart. U R my favorite valentine is the message the starts on the front of the card and is finished on the inside. 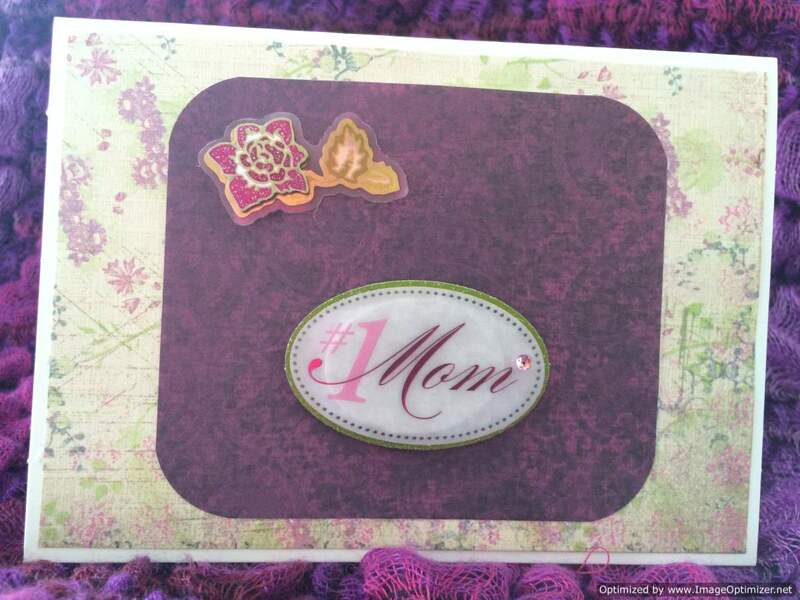 The “U R” are small pink vinyl stickers, the “my favorite” is a pink e dimensional sticker backed with herringbone plaid and “valentine” on the inside of the card is in script font on a pink background in the lower right corner. Honor the one who filled the void in your life and makes it complete. 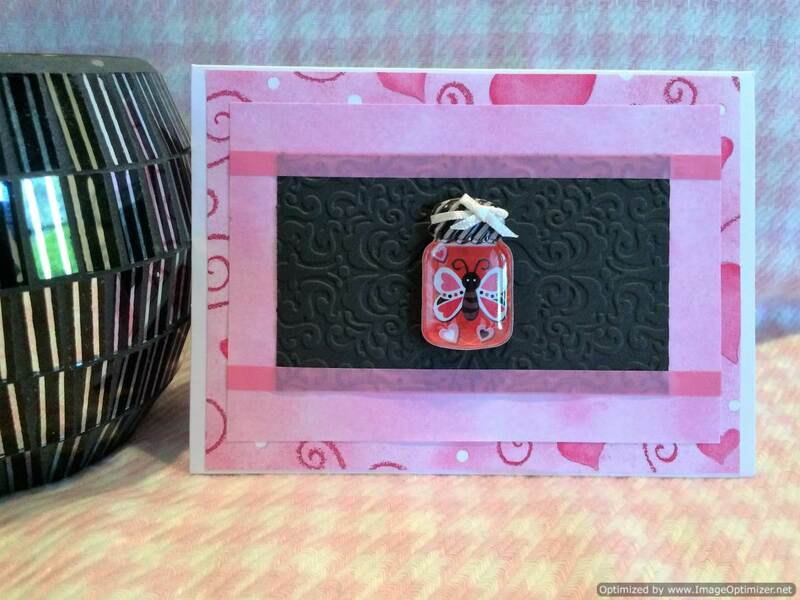 A bumble bee and large pink heart in a mason jar with a Bee Mine banner across the front. 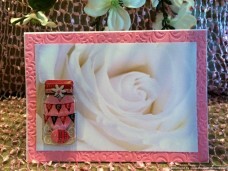 The jar sits on top of white rose paper backed with pink embossed paper. Tell someone thanks for bee-ing so nice. 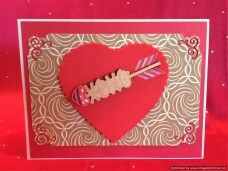 This simple little Valentine card is part elegant and part playfully fun. Valentine’s Day is a special holiday. 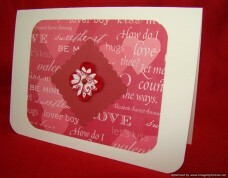 Love is in the air and this greeting card is meant for a loved one. The variations of pink is eye appealing. 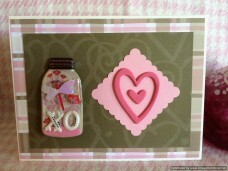 The background scrapbook paper has hearts of multi shades of pink. 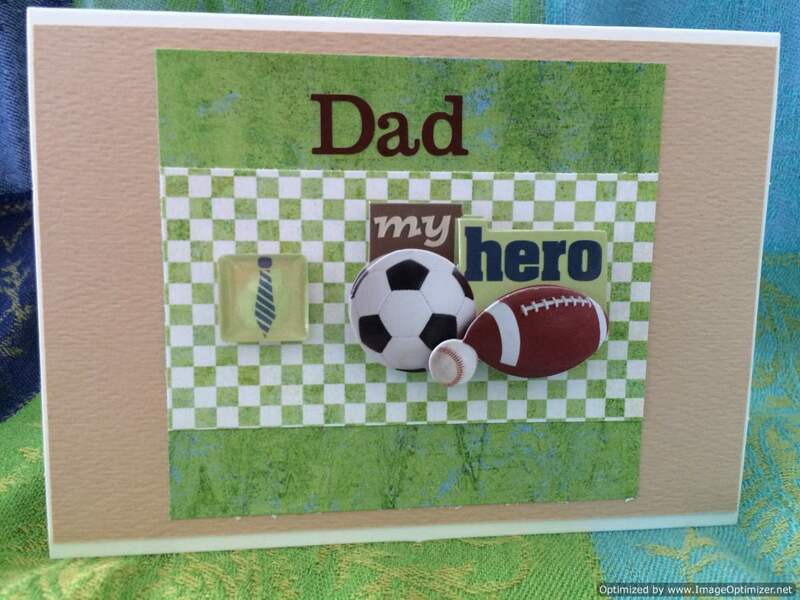 A foam decorative flower is the focal point of this card, it speaks for itself. 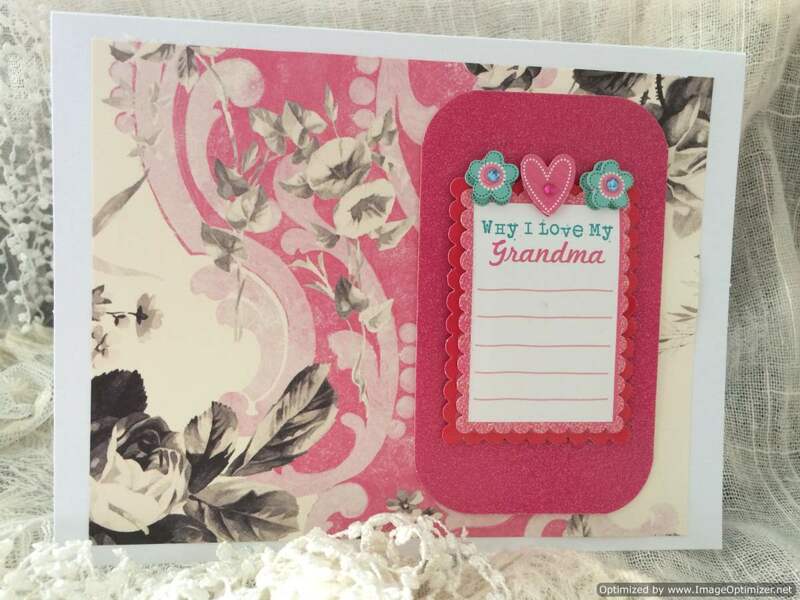 This unique Valentine greeting card in soft pink and ivory colors with a delightfully artistic pattern sends the message of love. 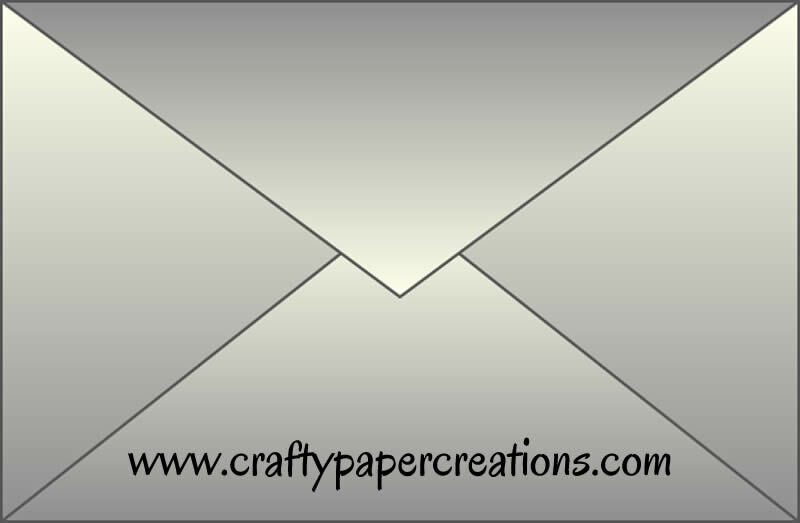 It has a boarder background of silky grey cardstock. 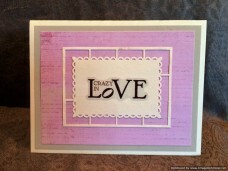 The Crazy in Love sticker is placed on a scalloped edge cutout bordered in a window pane. It truly is made for that special someone. The large jar filled with a dragonfly, flowers and XO white letters say love and spring are in the air. The diagonally place scalloped square is accented with two pink foam rubber hearts, one inside the other. The two patterned scrapbook papers are a pink and light brown plaid and brown on brown intertwined hearts of all shapes and sizes. 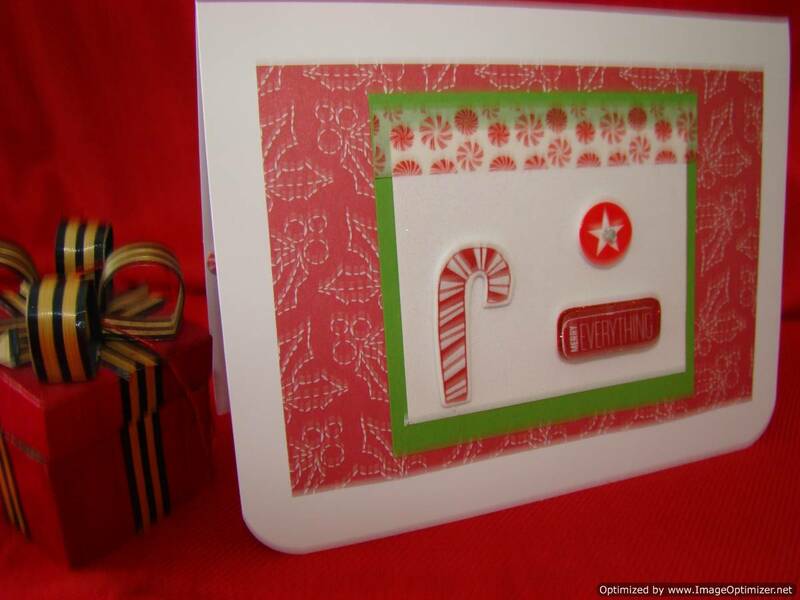 The inside vellum sticker is in the left lower corner with brown print and a pink scroll accent in the background. When you want words to express how you feel send this Valentine card. 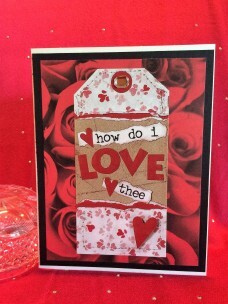 The background paper expresses words of love in many ways with a red flower centered for an accent feature. True love lasts forever. 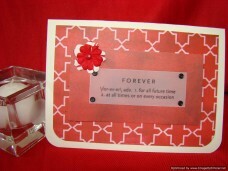 This creative Valentine card with rounded corners expresses the meaning of Forever. 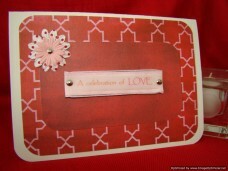 The deep red background of scrapbook paper and red & white flower makes the heart throb. 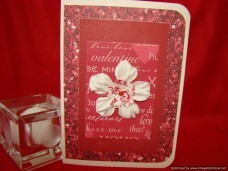 Three sparkling red embellishment hearts shine on this Valentine greeting card. It has 4 layers of paper, in multi colors of ruby red, black and silk grey. 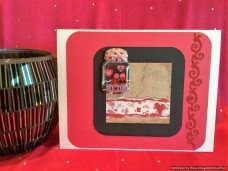 The background scrapbook paper has dancing musical notes which is very romantic for your special valentine. How do I love thee, let me count the ways. This love verse may be old, but it’s still a good one. The bright red rose scrapbook paper backed with black cardstock is accented with the sticker and adorned with a large clear gemstone at the top center. The round sticker inside is small with scalloped edges placed in the lower left corner. 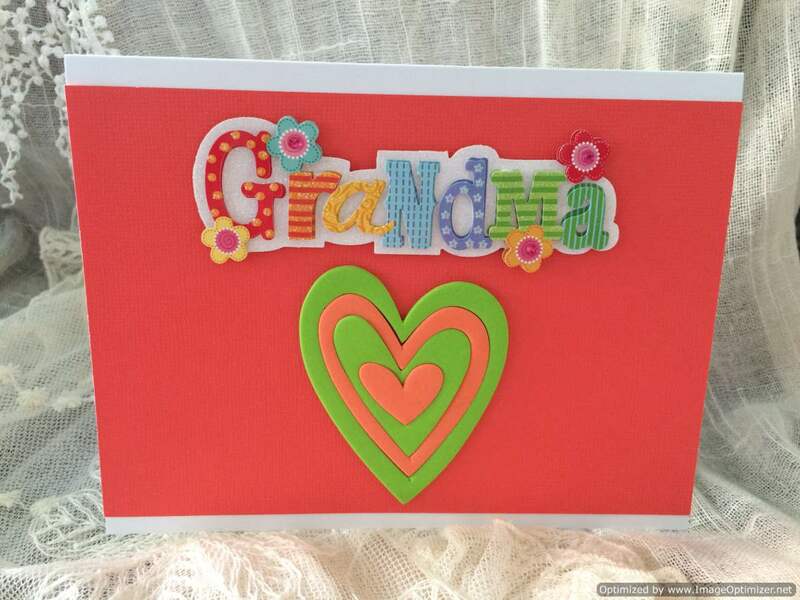 Rounded corner in scarlet red scrapbook paper with a sparkling special design runs vertically down the right side of the card. 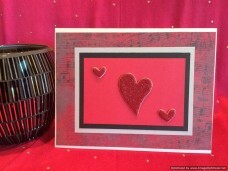 The black and camel tan with a ruffle of red hearts holds a whimsical 3 dimensional mason jar. Inside are valentine heart candies and an I love you on the jar. 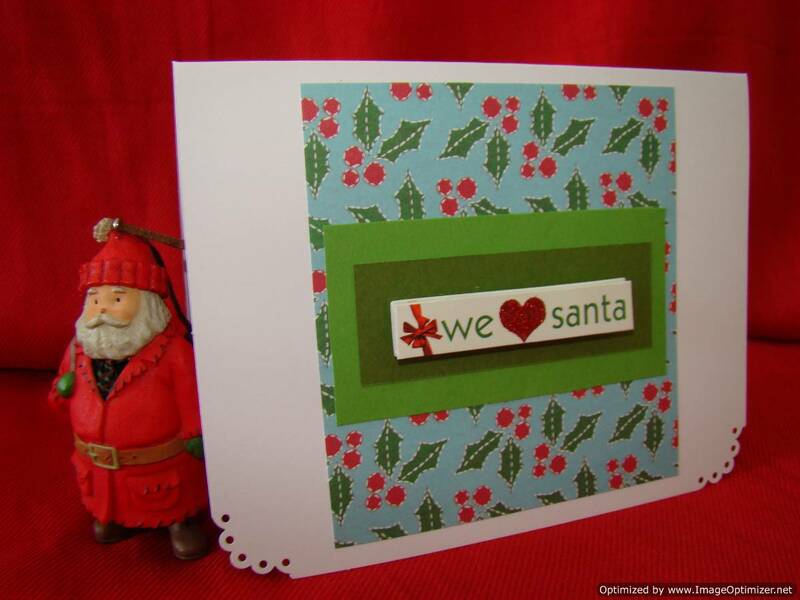 Imagine who would love to receive this crafty and unique greeting card. These two cute heart shaped snails in a mason jar are diagonally placed on a sticker of a large red heart with a key on a chain. 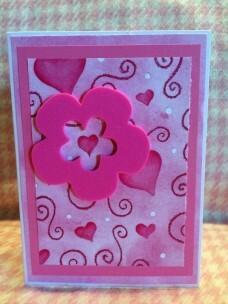 The sticker is placed on black embossed paper and pops on the bright pink posy cardstock. Wish someone a happy hearts day. The kissing snails make this a cute way to say I love you. How delightful this ladybug in a mason jar embellishment appears. 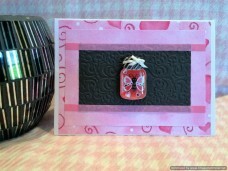 The shades of pink and black scrapbook paper compliment the jar with a black stripped lid and bow. 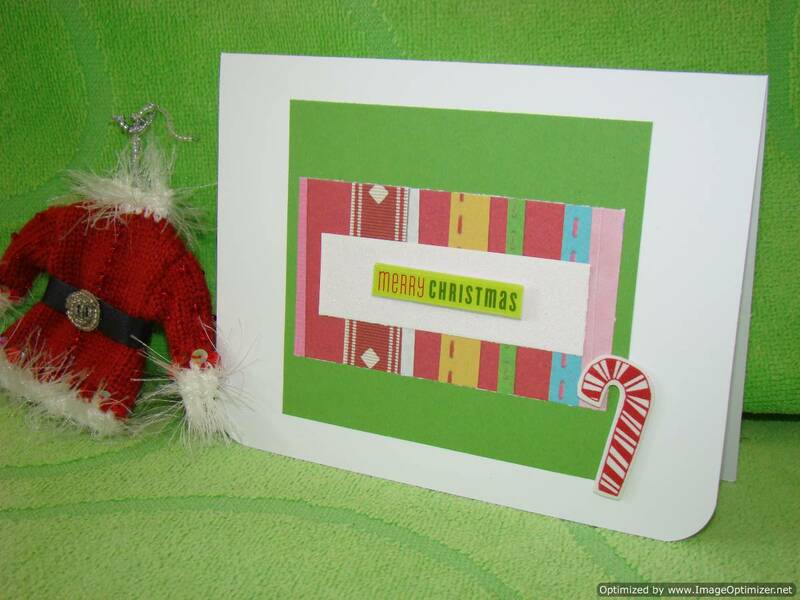 The card is very unique and will please the person who receives it. Love is meant to be, especially through a valentine card. When you want words to express how you feel send this Valentine card. 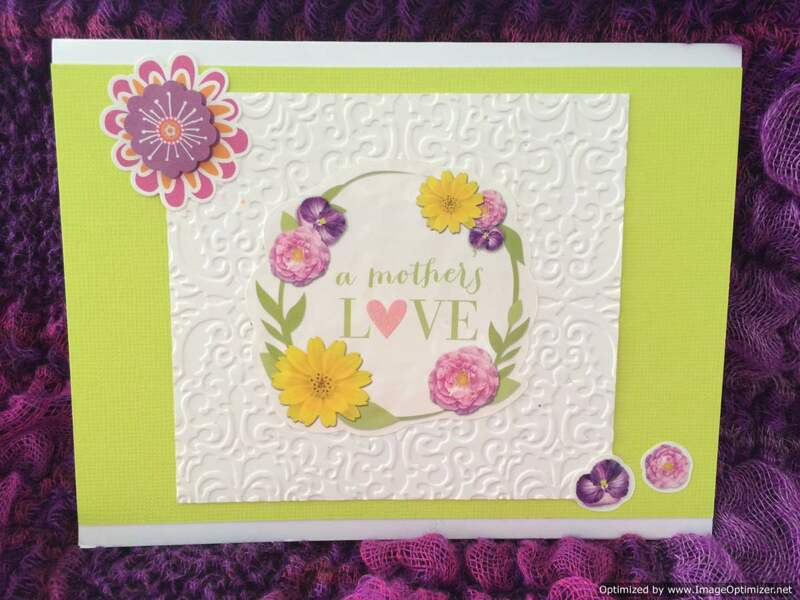 The background paper expresses words of love in many ways on dark red cardstock with a large red and white flower centered for an accent feature.